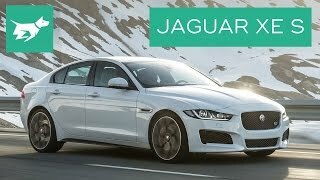 Jaguar XE S 2016’s main marketing was done by series of rumors, we finally everything comes to an end with customers having this new member all set to rule the streets. Jaguar with the release of XE S 2016 is very much enthusiastic and holds anticipations of beating the BMW and Mercedes. As of now we don’t know how far this will turn to reality but looking at their confidence it looks they definitely has some good packages in the gleaming exterior of this new release. Let’s have a closer look at what all this model brings with it. As soon as you open the door and enter the interior of Jaguar XE S 2016, you will stay amazed for a while with the gorgeously used Dar hex aluminum and ‘Riva Hop’ on door finishers. The race inspired interior brings the sporty throb in your veins before you sit over the Taurus leather seats featuring suede cloth panels and the tread plates. While the dials bring the F-Type style leather covered Electric Power Steering wheel comes with an S logo over it. The entire interior of Jaguar XE S 2016 is highly spacious and is made with rich attributes featuring sporty look. Apart from these features like, the all new infotainment system, stereo camera technology, traffic sign recognition, cruise control, blind spot monitoring and reverse traffic detection very well compliment the physically present windscreen featuring high contrast color images and the laser head-up display. 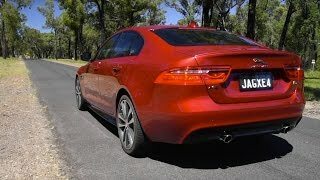 Exterior of Jaguar XE S 2016 is fine example of company’s all new modular architecture and intense use of lightweight material. Beginning with the front fascia of Jaguar XE S, first to mark aggression is strongly-sculpted bonnet part the luxuriously sportive appearance gets the blend through larger air intakes, large grille and with guard-like narrow headlamps. Moving towards the side, Side sill extensions and 20” forged alloy wheels holding red brake calipers beneath give a sporty touch. Further moving towards the rear fascia of Jaguar XE S, spoiler, gloss black valance and taillights too leave an impression of well-engineered design. 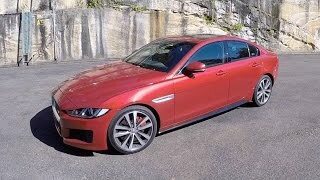 The most appreciable work in the entire exterior of Jaguar XE S 2016 is the use of lightweight material that makes this model much lighter than those it is about to compete with in market. 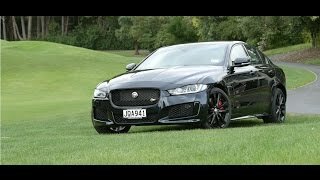 Jaguar XE S 2016 gets its power through a 3.0 Liter V6 engine producing 335 HP power and 450nm torque and is paired to ZF 8HP45 8-speed automatic transmission. The engine is capable of taking the driver to a top speed of 155 mph while the 0-60 mph sprint stands still at 4.9 seconds.